Prof Dr Sadeka Halim, Dean of Social Sciences of Dhaka University, Prof Dr Mahbuba Nasreen, Director of the Institute of Disaster Management and Vulnerability Studies, Prof Dr Gobinda Chakraborti of Political Sciences, and Prof Dr Olaf Guenther, Department of Asia Studies of Palacky University of Czech Republic, are seen at a seminar at Dhaka University on Thursday. A seminar on ‘Water and Deltas: Comparing Amu Darya and Ganges Delta’ was held at Dhaka University on Thursday. Prof Dr Olaf Guenther of the Department of Asia Studies of Palacky University of Czech Republic presented key-note paper on the topic at the seminar. 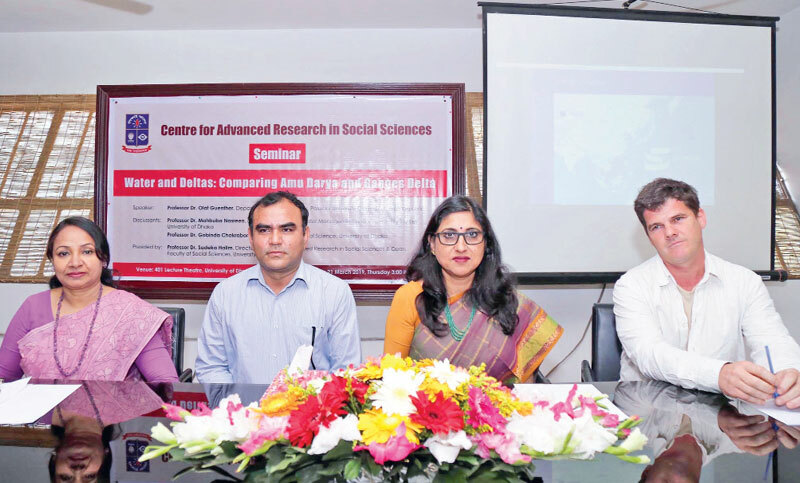 Presided over by Prof Dr Sadeka Halim, Director of the Centre and Dean of Social Sciences of Dhaka University, the seminar was also addressed by Prof Dr Mahbuba Nasreen, Director of the Institute of Disaster Management and Vulnerability Studies and Prof Dr Gobinda Chakraborti of Political Sciences of DU. Teachers and Students of different departments attended this seminar.